The 15-Hour Broker Pre-License Applied Real Estate Principles course is a mandatory component of Illinois broker pre-license education. This 15-hour course must be taken in an interactive format, either in a live webinar or a classroom. 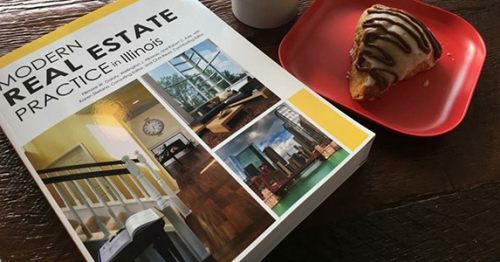 If you are interested in obtaining an Illinois broker license, you must successfully complete the 15-hour Broker Pre-License Real Estate Principles course AND the 75-hour Broker Pre-License Topics course before you can sit for the Illinois State & National real estate license exam. ***Webinar registration closes at the end of the BUSINESS day prior to the selected dates. *** (for example, registration for a January 2-3 webinar would close at 4:30 on January 1). All webinars start promptly at 9:00 a.m. both days. End time is 4:00 – 4:30 p.m. both days. The instructor will announce breaks and lunch period during each day’s session. Students are required to be online for the entire course time and interact with poll and quiz questions. Attendance is taken throughout the webinar. If a student misses more than 15 minutes, they will be required to retake the entire 15-hour webinar. On the day of purchase, students will receive an email from Eastern Illinois University, a partner of the Illinois REALTORS® Licensing & Training Center, with a username and password along with instructions to log into the Desire 2 Learn (D2L) webinar platform. The course materials will not be available until five days prior to the course start date. All materials can be downloaded and/or printed once the course is open. Five days prior to the webinar, you will receive an email from Illinois REALTORS® with further information about accessing the online rooms and coursework. Computer with a strong internet signal. You will be able communicate with the instructor through a chat feature. The course closes 30 days after the conclusion of the webinar. Students are allowed one date change prior to the closing of registration at no charge. Subsequent moves will require the payment of a $15 processing fee. “No Show” students will be charted a $35 new registration fee before being registered for another date. Webinar registrations will be honored for 12 months FROM DATE OF PURCHASE i.e.) purchasing a webinar in January 2019 gives participants until January 2020 to complete the webinar without repurchasing.